About a year ago, entrepreneur Matt Griffin and his wife, Emily, decided their company needed a boost. 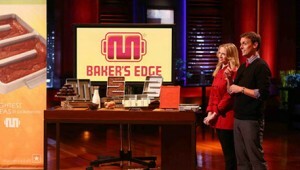 The two own Baker’s Edge — the company that makes the brownie pans designed so that every piece has chewy edges — so Matt emailed the producers of ABC’s “Shark Tank” about appearing on the show to pitch their company to the show’s panel of investors. And he heard back. Then came the rest of the process. That meant an invitation to go to Los Angeles and meet with producers and pitch their product to them. Of course, Griffin can’t talk about what happened next. You’ll have to tune in tonight at 8 p.m. on ABC to find out whether he and his wife got a deal. But I can tell you that he certainly sounded pleased to be appearing on the show’s season finale. 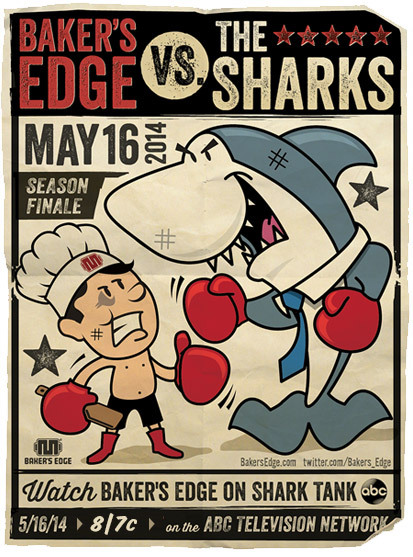 “Just to get to the point where we could talk to the sharks is a huge achievement,” Griffin said. But I wondered: is going into the “Shark Tank” really as tough as it looks? To find out what happens and whether one of the sharks offered a deal to help Baker’s Edge grow beyond their niche brownie and lasagna pans, check out tonight’s season finale at 8 p.m.